The world of technology is evolving and so has my6sense. With innovation and you in mind, we bring to you the ultimate personalization experience – Smart Magazine by my6sense. Imagine having all your favorite articles, posts and tweets readily organized on your phone in a beautiful intuitive interface. Mimicking the look and feel of a real paper magazine, with the optimized functionality of a smart phone. Click on articles you like, skip through those you don’t. We will learn to bring you more of what you love, and manage to surprise you with stuff you didn’t even know you cared for. This simple-to-use tool organizes your content into pre-defined categories, which may be customized to tailor to your individual interests and needs. The level of accuracy will astonish you; the more you interact with the application the better it gets. You can switch interests every day, and we will adapt. You will never have to tell us what you want to read, but simply read what you enjoy at any given time. We not only present you with what you think is interesting, but also with what your friends think is interesting. We dive deep into your world of content, and learn from the small nuances of your interactions within the application. At every given moment, we evaluate and rank what you read, share and skip. What you get is a combination of what you, your friends and we think you find interesting – that’s the revolution! my6sense has already been recognized and profiled in top news sites including CNN, TechCrunch, ReadWriteWeb, Mashable, TheNextWeb, VentureBeat, GigaOM and CNET, and has also been nominated for many awards in its field. As members of Microsoft’s BizSpark One program, my6sense believes it can be your ultimate content guide. We will help you be heard, and others be found. 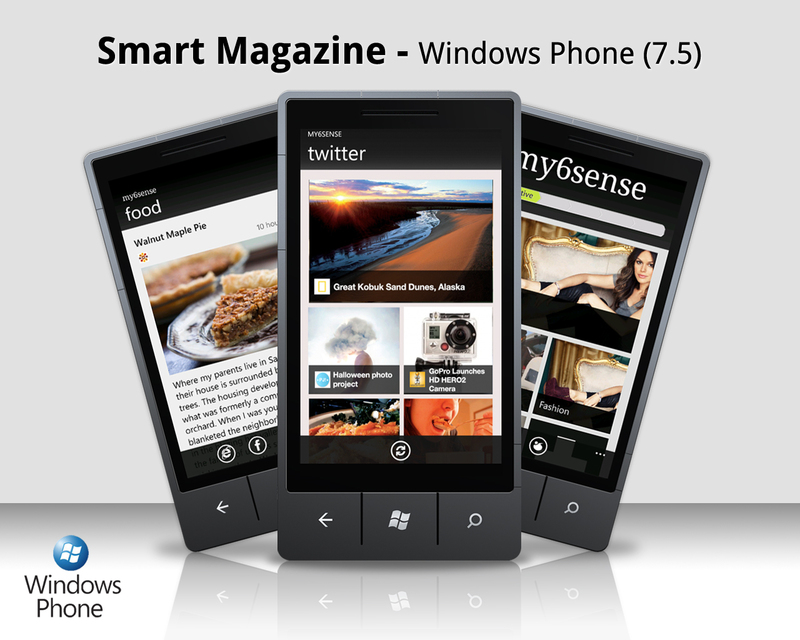 Smart Magazine is your personal scout for Windows Phone 7.5.